Did you know: The quickest way to measure a box is by looking at the opening of the box and measuring the longest panel first? Using a tape measure, place it in the bottom of the box (approximately one inch from the back wall) and measure from left to right. Repeat the process on the shorter panel. Do measure the depth, fold a side flap inward (until it is perpendicular to its vertical side wall) place the tape measure at the end of the flap and extend it downward until it rests on the inner flap at the bottom of the box. Did you know: that box sizes are measured using the inner dimensions unless otherwise specified? The size of what needs to be contained determines the inner box dimensions. Those dimensions are usually listed in the following sequence: Length (L) x Width (W) x Depth (D). Box dimensions are based on the opening of an assembled box. 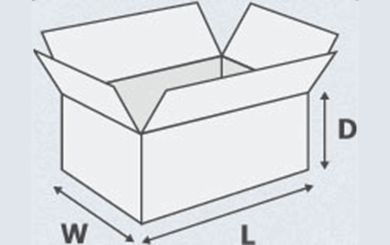 Looking at the opening, the longer of the two sides is considered the “length.” The shorter of the two sides is the “width.” The side perpendicular to the Wlength and width is the “depth” of the box. 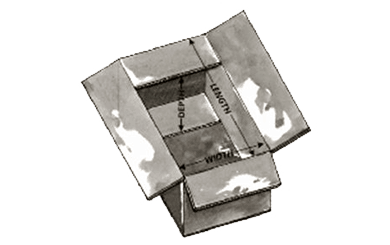 While this is true for most boxes, there are some exceptions (bookfolds, bin boxes, and divider bins) where the “width” precedes “length” and “depth” in the measurement sequence. Want to start building your own boxes online? Click the button below to do so.